Pricewise give you an opportunity to profit risk free every Saturday and Sunday morning at 8.30am, alarm clock at the ready! How do we profit from Pricewise? Tom Segal, nicknamed Pricewise, is a popular tipster from the Racing Post that has repeatedly posted winning picks and many people follow his tips. The Racing Post normally releases these tips on Friday 8pm with the odds of the tips. Pricewise’s tips are normally for races on Saturdays and Sundays. As the tips are released on a Friday evening, by Saturday mornings the odds that they printed will have been different, as the actual odds of the horses that are tipped will have dropped by a lot. Because of this, the Racing Post has made a deal with major bookies to increase their lowered odds back to the Racing Post’s printed odds at 8:30am Saturday morning for a short period of time, usually until 8.45am. However, when major bookies increase their odds to the originally printed odds, the odds on the exchange will not increase, and that’s where we’ll make our risk-free profit. Often the horses tipped will have odds from 5.0 to 15.0 which means a £10 back bet will require a lay bet with a liability of between £50 to £150. Given the races are not until the afternoon, this will tie up those exchange funds until the afternoon. So if you have a limited exchange balance, you may wish to complete other football or racing refund offers instead of Pricewise, if they are more profitable and require less liability. Pricewise tips Bigbadjohn to win at the Kempton 2:00pm race. At the time of printing the tips, the odds for Bigbadjohn is at 12.0 and lay 13.0 on the exchange. When the tip is released on Friday evening, many people follow the tips and places bets on Bigbadjohn. This causes the bookmaker and exchange odds for Bigbadjohn to drop significantly, all the way down to 10.0 and lay 10.5 on the exchange. At 8:30am Saturday morning, all major bookies will increase their odds back to 12.0, which were the odds at the time of print, as part of their deal. However, the lay odds for Bigbadjohn at the exchange will still be close to 10.5, which creates an arb for us to profit from! In effect, this is the same as a price boost. The duration of the increased odds for each bookmaker will be the same, around 10-15 minutes. If there are any changes to the race, such as any non-runners, all bookies will no longer increase their odds to the printed odds during this time. 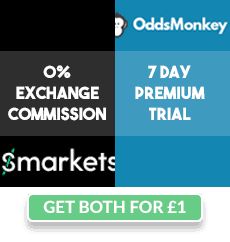 I recommend checking out the OddsMonkey Pricewise guide which will give the very latest information on each bookmaker. You would have to be up at 8:30am on the weekends, as that’s when the bookies will increase their odds back to the original printed odds. The increased odds will last only for a while, around 10-15 minutes, so be sure you don’t miss this window. If you don’t have an Oddsmonkey subscription, you can check the Racing post website here after Friday evenings for the weekend’s pricewise tips. 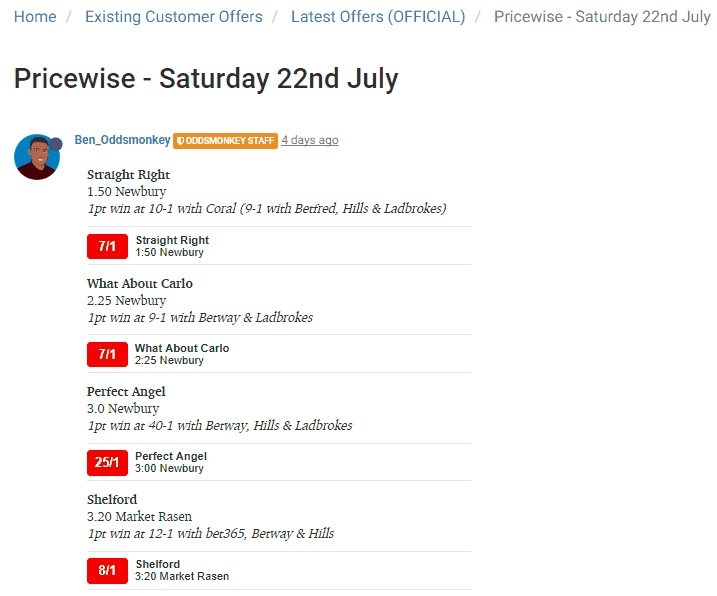 Once you have the Pricewise selections, go to the bookies at 8:30am on Saturday mornings (9:00am for some bookies) and check each pricewise selection. If the odds have increased, enter them and the lay odds into the Calculator tool under “Normal” mode, and place your bet and lay it. This is exactly the same as a price boost. You should see a tidy profit risk free due to the back odds being higher than the lay odds. If the odds have not increased, there may have been a non-runner in the race, and you can look to the next pricewise selection. You can place a bet on a pricewise selection on all the bookies that increase their odds, which will further increase your risk-free profits! I'd recommend applying the mug betting guidelines to Pricewise i.e. avoid taking it up all the time, vary your stakes and place some bookmaker bets from your phone. For more details on this, check out the mug betting guide. If you have already gubbed accounts, it may be best to do pricewise on those accounts. If you don’t have any gubbed accounts, you can take the occasional pricewise and mug bet a little bit to keep your accounts healthy.